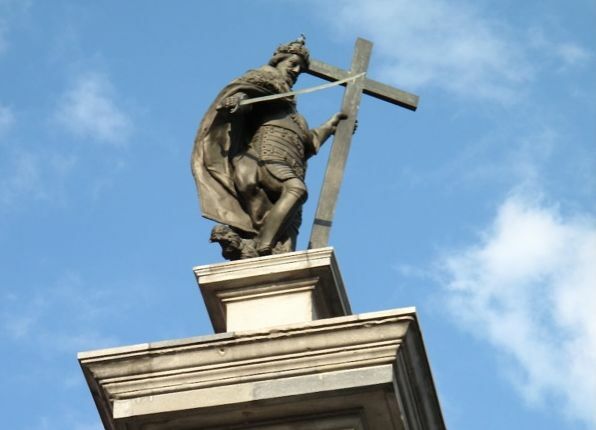 The Column of Sigismund was built in 1644 and it is one of the most famous symbols of Warsaw and one of the oldest secular monuments in northern Europe. 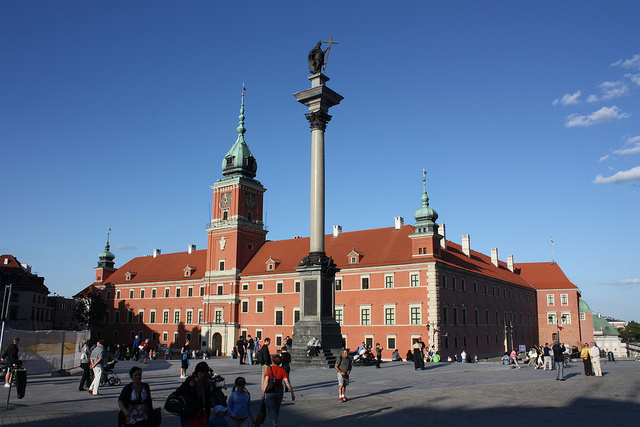 The column and the statue commemorate King Sigismund III Vasa, who moved the capital of Poland in 1596 from Krakow to Warsaw. Built between the years 1643 and 1644, the column was made to the order of the son and successor of Sigismund, King Władysław IV Vasa. It was designed by the Italian origin architect Constantino Tencalla together with the sculptor Clemente Molli and built by Daniel Tym. 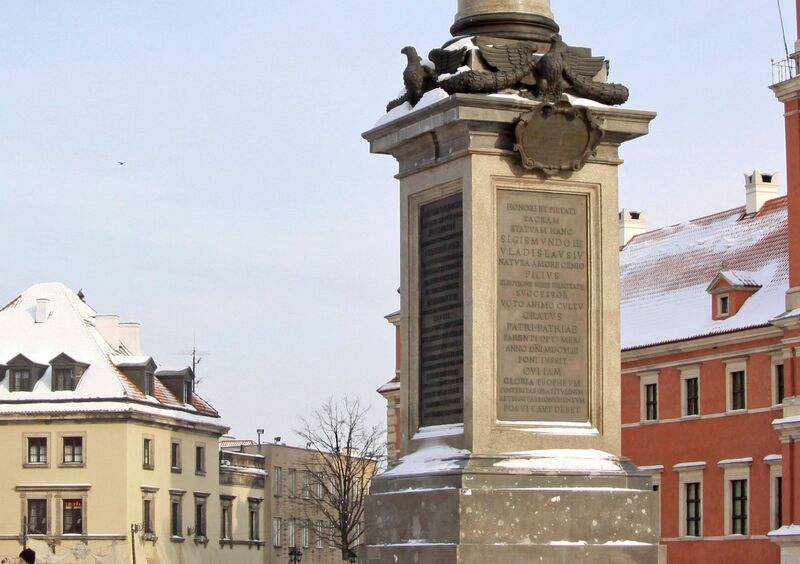 The Column of Sigismund in Warsaw was modeled after the Italian columns in front of the Basilica di Santa Maria Maggiore built in 1614 according to the plans of Carlo Maderno and the Phocas Column in Rome. Władysław Vasa have seen both columns during his visit to Rome in 1625. In 1681 the monument was surrounded by a wooden fence, which was later replaced with a permanent iron fence. The marble column in Warsaw itself was renovated several times over the next few centuries, especially in 1743, 1810, 1821 and 1828. In 1854 the monument was surrounded by a marble fountain with Tritons carved by the German August Kiss. In 1863 the Column of Sigismund was renovated again, but not enough, and between the yars 1885 and 1887 it was replaced with a new granite column. Between the years 1927 and 1930 the monument was restored to its original appearance, the fountain and the fence around it being removed. On the 1st September in 1944 during the Warsaw Revolution the monument was demolished by the Germans and the bronze statue was badly damaged. After the war the statue was repaired and in 1949 it was placed on a new column, made of granite from the mine of Strzegom, at a few hundred meters away from the original site. The broken parts of the original Column of Sigismund can still be seen near the Royal Castle. 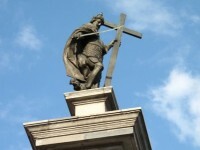 On the Corinthian column from red marble and with a height of 8.5 m was placed a sculpture of the King dressed in armor. The Column of Sigismund in Warsaw now has a height of 22 m and it is adorned by four eagles. The King is dressed in armor, wearing a cross in one hand and is armed with a sword in the other.